When I was in seventh grade, I used some birthday money to buy my first journal. It was small, spiral-bound, made of recycled materials (I was a burgeoning environmentalist), and had a soccer-playing puppy of the Hello Kitty variety stamped on the front. It came with a small silver lock and two tiny keys, which I lost within the first week of purchase; I had to resort to using the long piece of my pen's cap to jimmy the lock open. Day after day I poured my prepubescent heart out onto those brown recycled-paper pages. How competitive soccer was going, weekend plans with friends, and all about that guy in my first-period drama class. With the turn of the page not only would my handwriting change from loopy squiggles to linear scratches, but my desires would oscillate. It was the most important thing of my life that I got to dance with that guy at the fall dance. Then it was the most important thing of my life that I made the school soccer team. Then the most important thing was that I brought up my grade in history. I was madly in love with that guy, until I met this new guy. Unearthing this journal in a dusty box stored on a shelf in the garage, I found myself engrossed in a past that read more like an after-school special than an average junior high experience in the Northern California suburbs. It was fascinating to be reintroduced to a me that didn't know me yet. A me that penned my life across the pages and pinned my heart onto whichever silver cloud happened to be floating past in that moment. I have a somewhat more respectable journal now. It's a Moleskine because that's what all the writers at the cool table use. And it's purple because sometimes your favorite color doesn't change from junior high. I write in my neat grownup handwriting of how it is the most important thing in my life that I get better at this stay-at-home parent gig. It is the most important thing in my life that we get that house. It is the most important thing in my life that I blog. That I write. That I network. That my marriage gets stronger. That I don't unintentionally ruin my kids. That I am prioritizing quiet time with the Lord. The specifics of my life have changed drastically—I finally got those braces off and did eventually find the one and am living some sort of haphazard happily ever after—but still, day after day, there are my desires bleeding from my heart onto the page in blue ballpoint ink. 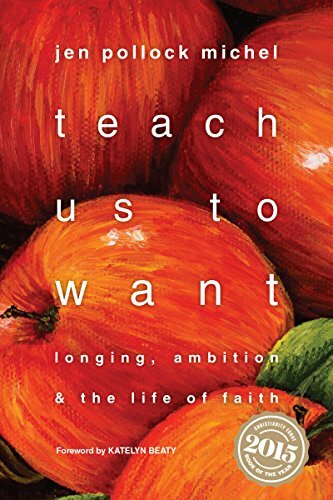 "Desire is primal: to be human is to want," writes Jen Pollock Michel in the opening chapter of her praiseworthy new book Teach Us to Want. Certainly this is not new information, but in this compelling book that masterfully interweaves juicy personal narrative, scholarly research, and solid biblical exegesis, Michel builds a case for the importance of examining desire's many facets: "Desire is the powerful subtext of our lives. It determines our decisions. This is why we need to pay attention to it." With grace and humor, she bravely bares her own stories of struggle with wanting and loss, hope and doubt. Her vulnerability elicits the reader's trust. Here is a worthy and compassionate guide to join on this important journey; Michel helps us distinguish between What do I want? and What does God want for me? Using the Lord's Prayer as a rubric to frame our naked wanting, the reader is invited to consider Jesus' language of prayer as a way of realigning our hearts with God's purposes and priorities. These "are words we pray, not always because we believe them but because we want to believe them." Our desires, though warped by our sin, have been placed in us by God, and it is his desire to recalibrate our hearts for the glory of his kingdom. Though it would be easy to float off in many divergent theoretical theological directions, the book stays grounded through relatable stories and practical application. One of the things I found myself appreciating most about Teach Us to Want is that Michel does not shy away from the dark and difficult side of desire in our selfish ambition or disappointment in God's provision, nor does she attempt to offer "tidy answers for what remains inexplicably messy and complex." She's not a used car salesman trying to dress up the "problem" of our wanting and repackage it for us as consumers. She does not attempt the role of smooth-speaking political pundit spinning the situation at hand into a more favorable scenario. Rather, she gives space to breathe in the tension of God being good even when life is not. Michel has attempted no small task here. Were this a thick, linen-bound tome titled "Theology of Desire," I would likely still read it, though I would not be recommending it to every person in my general acquaintance as I do now. Though there is a consistent thread throughout, there were parts of the book that felt a bit disjointed—understandable, considering both the breadth and depth she is attempting to cover in just over two hundred pages. This is the kind of book you set down not because it has lost your interest, but because you need time to soak in its profound intricacy.